As with all of MCM's exhibits, the back story is fascinating. Museum staff worked to find a small historic log cabin, and eventually located one built by the Gotten family circa 1840. 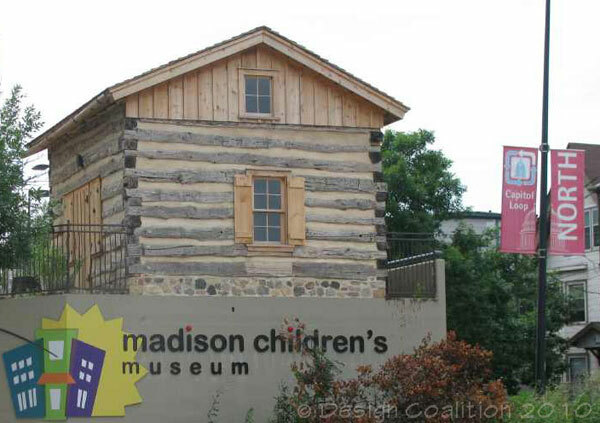 Then they spent months with local historians to reconstruct the history of the museum's site in exhaustive detail, in order to use the log cabin as a vehicle to tell children the story of that part of Madison. It's location on the triangular prow of the existing parking deck gives the cabin special prominence as the Museum's northern entry gateway. And importantly, the cabin exhibit provides the Museum's only ground-level outdoor space on this landlocked downtown site. 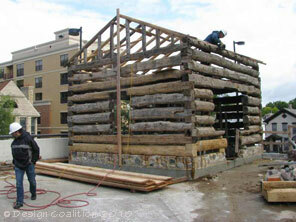 The log cabin exhibit team worked closely with Damian, a reconstruction expert with decades of experience with historic buildings at Old World Wisconsin. However, this would be unlike any other reconstruction he'd done. 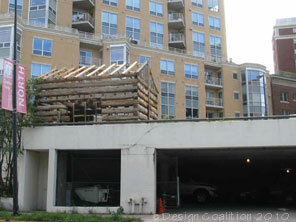 This cabin would be built on a raised concrete parking deck in downtown Madison, would need to be wheelchair accessible, and would need modern -- but concealed -- insulation, heating, lighting, exiting and fire-protection systems. We worked with structural engineers and code officials to achieve an exhibit that meets modern standards but remains authentic in look and feel. September '09: The cabin and site design is finally through the lengthy City approval process and is under re-construction. As an all-wooden structure within the special Capitol Fire District, and a building addition within both an Urban Design District and a P.U.D. 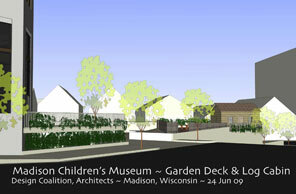 zoning district, this exhibit came under close scrutiny from many City of Madison departments. 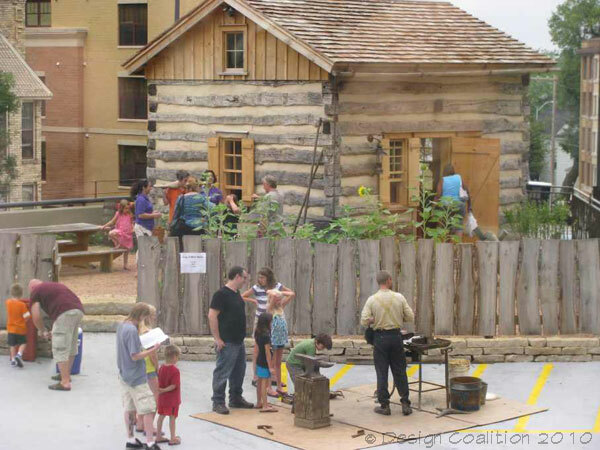 (view from the Museum, below) By opening week the cabin's authentic kitchen garden included heathy stands of sunflowers and maize, and featured a demonstration of blacksmithing. The interior is loaded with period artifacts which children can handle and use.